1. Please install the driver at first , you can find the driver installation file from CD, then you can plug your usb wifi adapter into your device. 2. 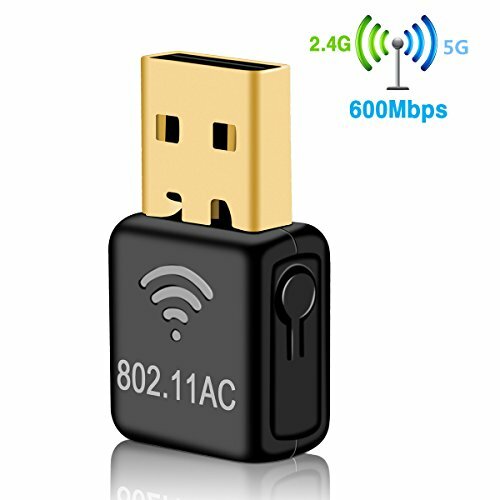 This Wifi Dongle has two bands, but it can run at up to 433 Mbps speed only when connected with router which support 5 GHz band and its min speed is at least 433 Mbps and up to 150 Mbps speed when connect with router which support 2.4 GHz and its min speed is at least 150Mbps. ◆With speeds up to 600Mbps, the Wonsidary 600Mbps High Performance Wi-Fi USB Adapter is well-suited to Web surfing, e-mailing, and video chatting. ◆The 600Mbps is about the size of most thumb drives, so it fits easily in the pocket of your computer bag or in a desk drawer. You can insert it into your USB port when you need Internet access and remove it when you are finished. ◆ Whenever there is only wired Internet connection, you can activate the analog AP function after installing the included CD software, and create a Wi-Fi hotspot for other mobile devices. Wireless Mini USB Adapter is a perfect solution to upgrading your computer's wireless networking speed. ◆Enjoy more convenience with your wifi USB adapter, with AC600 wireless AC adapter, you can shift between 2.4GHz and 5GHz wifi bands to avoid interference and have optimal wifi internet connection for your PC, laptop or Mac. 【Ultra-Speed Version】Up to Wi-Fi speeds of the 5ghz wireless adapter on 5GHz (433Mbps) or 2.4GHz (150Mbps) bands, dual band of the wifi adapter reduces interference and reduce freezing and lags when streaming and gaming. Upgrade PC to 802.11ac, the latest and most powerful wireless Wi-Fi technology and 3 times faster than 802.11g wireless networking. 【WPS one Key Encrption & Analog AP Function】WPS one key encrption for Quick Security Setup. In addition, the wireless mini wifi dongle supports Soft AP mode in Windows system and makes the adapter into virtual WiFi hotspot, let your ipad, mobile phone to access wireless Internet. 【Works with Any WiFi Routers】By using the AC600 USB WiFi adapter, you can upgrade your PC,Laptop or Mac to work with the latest AC WiFi router for faster speed and extended range. No worry about network cabling. 【High Compatibility】The usb network adapter works with any wifi routers, compatible with Windows XP / Vista / 7/8 / 8.1 / 10, Linux 2.6 or above, Mac OS X 10.6 / 10.7 / 10.8 / 10.9 / 10.10 / 10.11 / 10.12 /10.13 operation system. 【Quality Service】We focus on providing customers good products and service. If there is no CD-ROM or there is any issue, please feel free to contact us, we will give professional technical support, and return service. If you have any questions about this product by Wonsidary, contact us by completing and submitting the form below. If you are looking for a specif part number, please include it with your message.